A regular sight in the Panini lineup, the 2017 Panini Certified Football checklist caters to both hit and set collectors. This includes ten inserts or parallels per hobby box to go along with four autographs or relics. 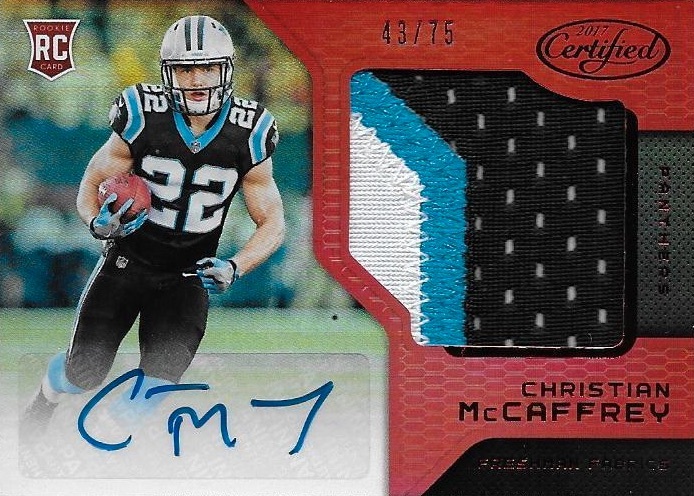 While the four hits are open to multiple possibilities, collectors can expect at least one to be a Freshman Fabric Signature card. Top-six RPS rookie players are an inner-case hit along with a signed card limited to 10 copies or less. 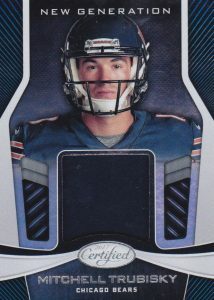 Base cards aren't normally a key element in a set like this, but they, along with the inserts, form the basis of the non-hit choices in 2017 Panini Certified Football. The 200-card set includes 100 veterans, 35 Immortals (#/999) and 65 Rookies (#/999), each with their own assortment of Mirror parallels. 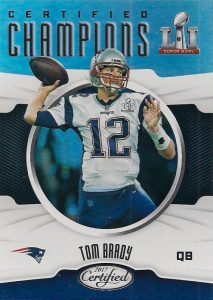 Standard inserts include Certified Accomplishments for the award-winning players, Certified Champions for those who won the Super Bowl, and Gold Team for the truly elite. 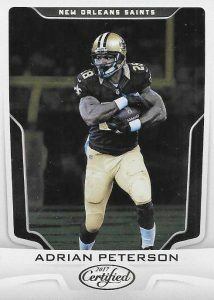 These all combine with parallels, numbered to 99 or less, to average one per pack. 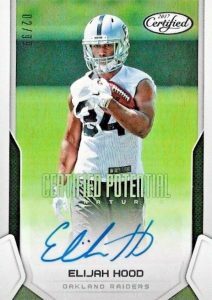 Making the '17 NFL rookie class a top priority, 2017 Panini Certified Football is led by the box-hit Freshman Fabric Mirror Signatures. There are also limited parallels such as Emerald and Black along with quality logo, nameplate and shield patches. 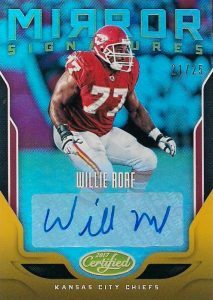 Also for the first-year players, Rookie Roll Call Signatures (#/75 or less) makes its Certified debut. Other possible autographs include the Gold Team Signatures, numbered to 10, and Fabric of the Game Signatures (#/99 or less) with a large jersey swatch. Prime parallels are limited to no more than 49 cards. 1 Freshman Fabric Signature for "Top Six RPS Rookies"
200 cards. Shop one eBay. 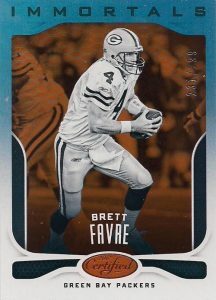 Base Immortals - #/999, Base Rookies - #/999. BASE/IMMORTALS MIRROR PARALLELS: Mirror #/499, Orange #/299, Red #/99, Blue #/50, Gold #/25, Purple #/10, Green #/5, Black 1/1. 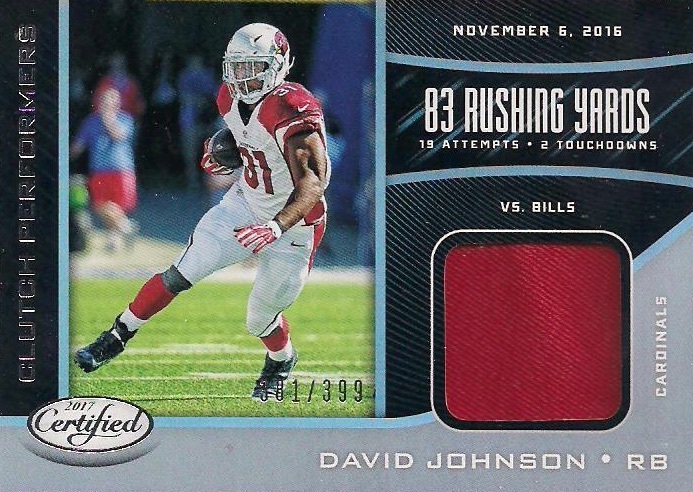 ROOKIES MIRROR PARALLELS: Mirror #/299, Orange #/199, Red #/99, Blue #/50, Gold #/25, Purple #/10, Green #/5, Black 1/1. MIRROR PARALLEL CARDS: Orange #/349 or less (No Taywan Taylor, James Conner*), Red #/249 or less, Blue #/50, Gold #/25, Purple #/10, Green #/5, Black 1/1. MIRROR PARALLEL CARDS: Red #/60, Blue #/40, Gold #/25, Purple #/10 (Luck, Hunter - #/5), Green #/5 or #/3, Black 1/1. MIRROR PARALLEL CARDS: Red #/99, Blue #/50, Gold #/25, Purple #/10, Green #/5, Black 1/1. MIRROR PARALLEL CARDS: Orange #/75, Red #/50 (Stafford - #/25), Blue #/25, Gold #/10 (Landry - #/8), Purple #/5, Green #/3 (Manning - #/2), Black 1/1. *Cam Robinson only in Green/Black parallels; Malik McDowell only in Purple/Green/Black parallels. MIRROR PARALLEL CARDS: Orange #/199 or #/75, Red #/99 or less, Blue #/50 or #/25, Gold #/25 or #/10, Purple #/10 or #/5, Green #/5 or #/3, Black 1/1. 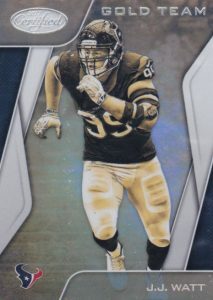 PARALLEL CARDS: Prime #/49 or less (No Kurt Warner, Eddie George*). MIRROR PARALLEL CARDS: Red #/75, Blue #/50, Gold #/25, Purple #/10, Green #/5, Black 1/1. ALLEN / PEPPERS PARALLELS*: Red #/35, Blue #/25, Gold #/10, Purple #/5 Green #/3, Black 1/1. *Desmond King found only in Green/Black parallels. MIRROR PARALLEL CARDS: Orange #/399, Red #/299, Blue #/50, Gold #/25, Purple #/10, Green #/5, Black 1/1. MIRROR PARALLEL CARDS: Red #/75 or less, Blue #/50 or #/25, Gold #/25 or #10, Purple #/10 or #/5, Green #/5 or #/3, Black 1/1. *James Conner only in parallels. Is the checklist out for this yet ? Is it still scheduled for release tomorrow ? Just discovered the checklist !! Jose: You have to select the black checklist tab above. If you can’t see that, refresh your page. 2017 Panini CERTIFIED Football Factory Sealed HOBBY Box *Patrick Mahomes RC?? ?